Grilled duck breast with olive-Sherry sauce. My home-cured olives have lost their punch. They still taste great, but the texture has changed and they are too mushy to serve as aperitif. I picked and pitted the olives myself, then brine-cured them with thyme, fennel and garlic. Because they have no preservatives, the olives don’t keep more than a few months. What to do with several jars of olives past their “best by” date? Use them in olive spreads such as olivada (a recipe is here ) and in cooked dishes where the texture doesn’t matter. 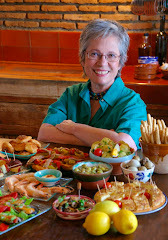 I’ve made Chicken with Lemons and Olives from Paula Wolfert’s original Moroccan cookbook, Couscous and Other Good Food from Morocco (Paula has a new Moroccan book coming out this year) many times, and will try her recipe for fish tagine with olives. 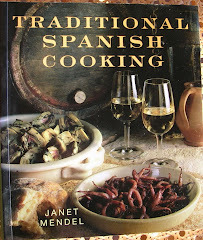 Surprisingly there are very few recipes for cooking with olives in Spanish cuisine. 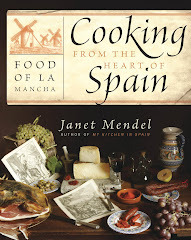 I did find one old country dish for duck braised with olives that comes from wetland regions, such as Coto Doñana below Sevilla and the Tablas de Daimiel in La Mancha, where wild duck is hunted. Feeding on fish and crustaceans, duck acquires a “fishy” flavor. 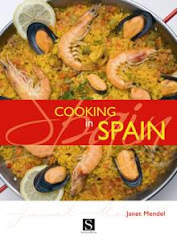 From that derives the custom of cooking it with assertive flavors such as sour oranges, tangy olives or strong wine. 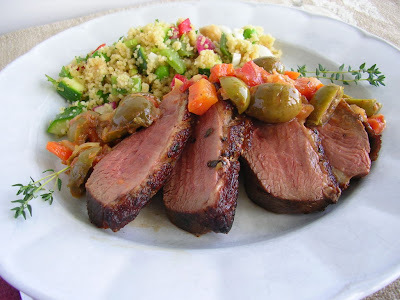 I decided to adapt the braising sauce, redolent with Sherry and herb-flavored olives, to accompany quick-grilled duck breast. Sliced and served rare and juicy, the duck was gorgeous with the tangy sauce. The accompaniment you see in the photo at the top is cous cous with peas, green beans, zucchini, red pepper, onion and radish. While a robust red wine is classic with duck breast, dry Sherry also goes nicely with the rich meat. Use a heavy skillet to grill the duck breast. As a great deal of fat is rendered from the meat, you will need to—very carefully—drain it off while the meat is cooking. 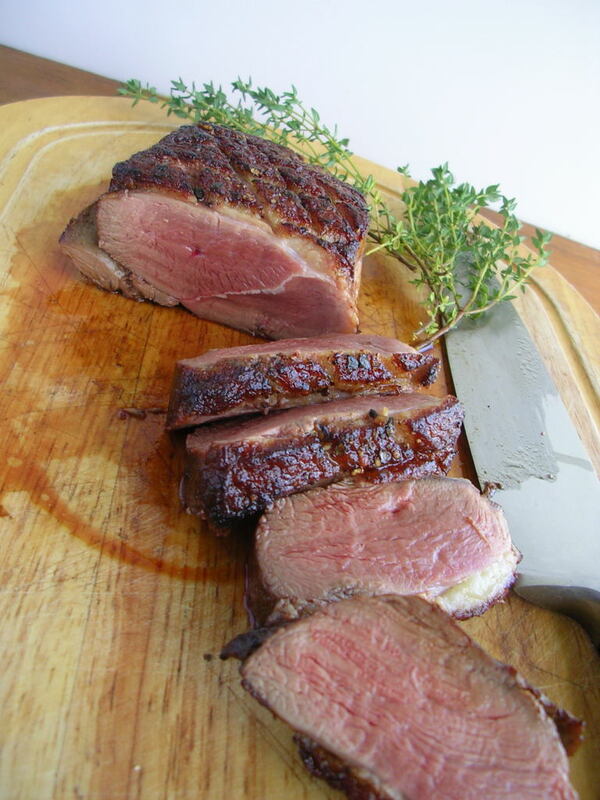 Duck breast is usually served very rare. Use a sharp knife to score the fatty side of the duck breast in a diagonal cross-hatch, without cutting into the flesh. Sprinkle generously with salt and pepper and Sherry vinegar. Allow to stand at room temperature for 30 minutes. Heat a heavy frying pan on medium heat. Brown the duck breast, fat side down, until fat is crisped and browned, 5 to 6 minutes. Very carefully drain off excess fat. 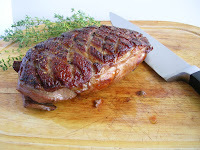 Turn the duck breast and cook until browned, 3 to 4 minutes. Turn the breast on end to brown the edges. The duck should be browned on the outside and rare in the center. Remove and allow to stand 10 minutes. Place on a cutting board and carve crosswise into ½-inch slices. Serve the slices topped with olive sauce. 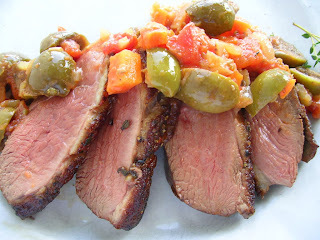 Duck breast with olive-Sherry sauce. 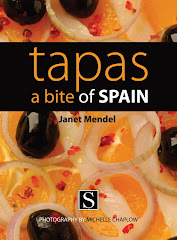 Olives and lemon peel give zest to this cooked sauce, which also goes well with grilled fish, lamb and chicken. Use any variety of pitted olive, green or black, for this recipe. Makes 1 cup of sauce. Heat the oil in a medium skillet and sauté the shallots, carrot and garlic until softened, 3 minutes. Add the lemon zest and tomato and cook another 3 minutes. Add the Sherry. Stir the cornstarch into the water or stock and add it to the pan with the cumin, thyme and pepper. Cook, stirring, 2 minutes. Cover and simmer until vegetables are very tender, 20 minutes, stirring occasionally. Add the olives and simmer 5 minutes. Taste and add salt if necessary. Serve the sauce hot or room temperature. Curing olives, that's something I've got to do before I die... ;) BTW, I believe the olivada link doesn't work. Miriam, Thanks for catching the non-working link. I think I fixed it--try again. 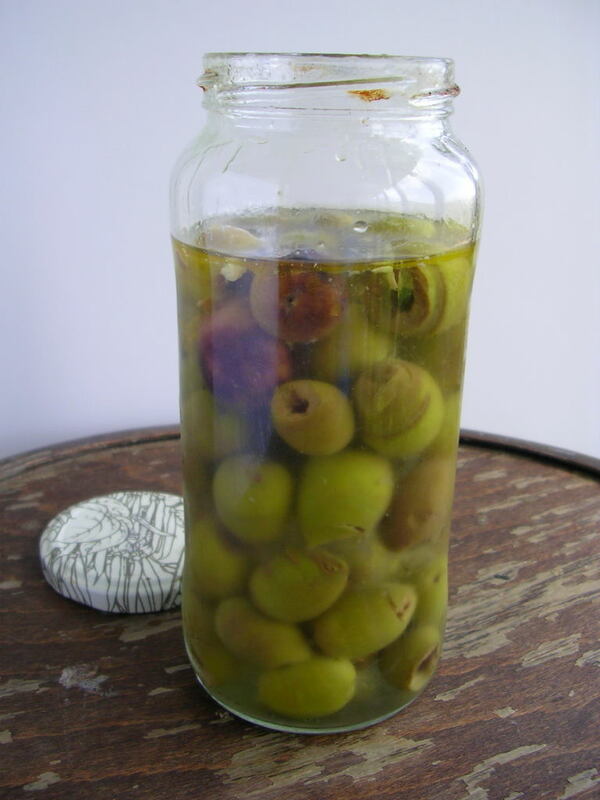 Have you any tips for curing olives? I've had a couple of goes, soaking in water (daily water changes) and them in brine for several weeks at each stage but have been unable to remove the bitterness to my satisfaction. I've seen a commercial caustic solution for olive curing (I'm in southern Spain as well), but I don't particularly want to go down that route. Merv, The link in this post to a recipe for olivada also has my instructions for home-cure olives. Basically, it's what you describe--water soaking, then brine. However, you have to either pit the olives or crack them to split them open so that the soaking penetrates the flesh, otherwise they never sweeten. Yes, I've tried the caustic solution, good for those fat manzanillas left whole. They come out tasting exactly like commercial olives you buy at the store. Thank you for that, I should have followed that link, I thought it was just for the spread. Some good tips there, I don't think my cracking was thorough enough last time, I just put in a few slits. I think I'll try pitting some as well next time. These recipes are awesome! 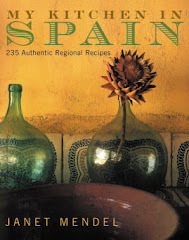 It is definitely hard to fine olive recipes.